of the white A in a circle of five colors called a thigle. white, then red, and then yellow, representing the five elements. "A-khrid.....The first cycle here of Dzogchen teachings is called A-khrid (pronounced A-tri), that is, the teachings that guide one (khrid) to the Primordial State (A). 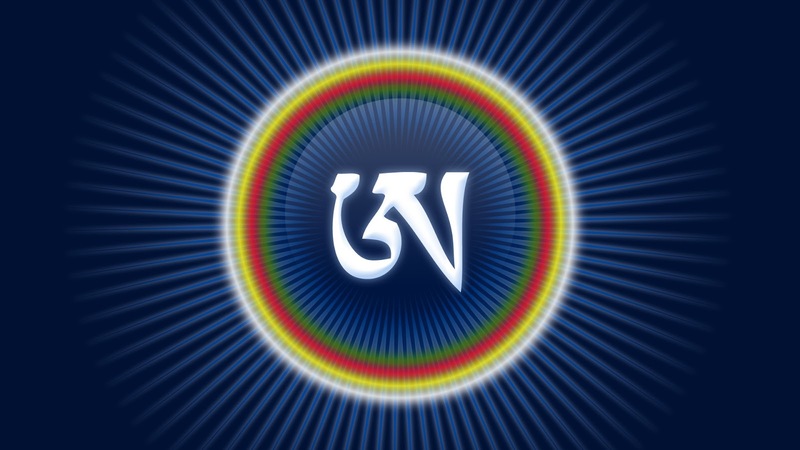 The white Tibetan letter A is the symbol of Shunyata and of primordial wisdom." "Thigle – Literally means “drops” and is traditionally used to describe ‘spheres of rainbow light’ which is the ground substance reality. ..In traditional Buddhism it is sometimes understood to be a very specific form or shape. However, from a Buddha Brats perspective it is the actual visual experience of the true nature of the universe experienced as particles of light which are seen as spinning or moving dots or wheels, both large and small. It can also sometimes be observed as squiggles or moving shafts of light.... More precisely its ‘nature’ can be described as Dakini (sky dancer) because of the way it constantly moves around. Its ‘form’ can be described as that of Daka (sky flower) when one sees the specific form that the light particles take. This gives one a direct experience of Dakini and Daka as moving, dancing light. tigle (tib: thig le; skrt: bindu) Tigle has multiple meanings depending on context. Although usually translated as "drop" or "seminal point," in the context of the dream and sleep yogas the tigle refers to a luminous sphere of light representing a quality of consciousness and used as a focus in meditation practice.